For nearly a decade, Lebanon's most powerful government ministry has been run by a single family. While ministers of defense and foreign affairs have come and gone with each new cabinet, the Interior Ministry has remained the personal fiefdom of Michel Murr and his son, Elias. Born in 1932 to a Greek Orthodox Christian family in the Metn village of Bteghrine, Michel Murr distinguished himself as an engineer during his twenties and became a successful contractor. He spent much of the 1960s living in West Africa and made a sizable fortune there in the construction industry. After returning to Lebanon, he was elected to parliament in 1968 by aligning himself with Pierre Gemayel, the leader of the Phalange (Kata'ib) Party who dominated politics in the predominantly Maronite Christian Metn district. Murr lost his reelection bid in 1972, a defeat which he is said to have blamed (unfairly) on Gemayel. Following the outbreak of the 1975-76 civil war, Murr backed the Phalange militia and its successor, the Lebanese Forces (LF), but gravitated toward its "Arabist" camp, along with Karim Pakradouni. In the mid-1980s, he backed the pro-Syrian LF faction of Elie Hobeika and participated in the negotiation of the Tripartite Accord, an agreement by Hobeika, Druze chieftain Walid Jumblatt and Amal leader Nabih Berri that would have legalized the Syrian presence in Lebanon. Hobeika and Murr were subsequently ousted from the LF by Samir Geagea and spent the rest of the war years in Syrian-controlled Zahle, waiting for the day when Damascus would complete its occupation of Lebanon. 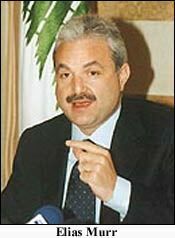 Following Syria's takeover of Beirut in October 1990, Murr (like Hobeika) was richly rewarded for his loyalty to the Syrians and assumed the post of defense minister. Like many other pro-Syrian politicians in Lebanon, Murr sealed his political ties through marriage - in 1992, his son Elias (b. 1962) married Karine Lahoud, the daughter of Army Commander Emile Lahoud. After serving as defense minister for several years, in the fall of 1994 he was appointed interior minister - a much more lucrative and politically powerful cabinet portfolio. As interior minister, Murr was in charge of domestic security and intelligence agencies, giving him an unparalleled capacity to threaten and intimidate other public figures in Lebanon. Arrogant and overbearing, he made many enemies. If a referendum were held, former MP Rushayd al-Khazen once noted, "we would see that nobody likes Michel Murr - not even his supporters, who first and foremost are afraid of him." The Interior Ministry also offered Murr a variety of lucrative opportunities to expand his fortune and build a political base of support. Since most types of commercial and residential construction in Lebanon require a permit from the Interior Ministry, these licenses could be easily bartered for bribes or political support at election time. In addition, Murr had extensive interests in rock quarries in the Metn district and used his ministry to restrict the issuing of licenses to competitors. During the 1990s, these quarries flourished as Lebanon underwent a major reconstruction boom. Not surprisingly, there were no government regulations obliging quarry owners to rehabilitate depleted sites and laws requiring operators to inform the government of the discovery of water supplies were not enforced. The result was immense environmental destruction and the burial of springs. Since Lebanese elections are run by the Interior Ministry, Murr had a great deal of power to compromise the integrity of the electoral process in a given district. Internal security forces illegally entered polling stations during the 1996 and 2000 parliamentary elections, so as to observe whether those who had sold their votes cast them accordingly (voters in Lebanon are not required to close the voting booth curtain when making their choice - and those who have sold their votes typically don't). Murr simultaneously served as minister of municipal and rural affairs, a position that allowed him to barter vital government services for political support at election time (so joined at the hip were these two ministries under Murr's control that they were later integrated into the Ministry of Interior and Municipalities). One of the greatest perks of the Interior Ministry was that it was empowered to review the files of around 300,000 non-Lebanese, mostly Syrians, who were naturalized under a controversial 1994 decree. Many of these newly naturalized citizens were forced by the Interior Ministry to register for electoral purposes in Murr's district of northern Metn. During the 1996 and 2000 parliamentary elections, these newly naturalized citizens were bussed by Murr to the polls to vote en masse for his electoral slate. Murr's periodic remarks that his ministry was investigating cases of people who were granted citizenship "by mistake" ensured that these hapless souls did not disappoint him on election day. Thus, in his home district of north Metn, Murr's control of electoral outcomes was virtually absolute - his electoral slate won all but one parliamentary seat in north Metn in 1996. When Murr's daughter, Myrna, ran for municipal office in their hometown of Bteghrine in 1998, nobody dared run against her. Like most other well-connected Lebanese elites, Murr brought Syrian partners into his business deals, building a strong base of support within Syria's military-intelligence apparatus. However, unlike Prime Minister Rafiq Hariri, who favored particular figures in Syria (e.g. former Chief of Staff Hikmat Shihabi and Vice-president Abdul Halim Khaddam), Murr spread his largesse to many different personalities. When Shihabi and Khaddam were later marginalized by Syrian dictator Hafez Assad's son and heir, Bashar, Hariri paid a political price for putting so many of his eggs in so few baskets. 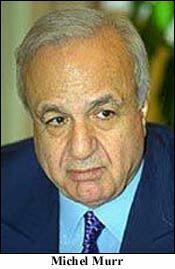 With the election of Gen. Lahoud as president in 1998 and the subsequent ouster of Hariri (and Druze leader Walid Jumblatt) from government, Murr's power was at an all-time high. With Syria's blessing, Lahoud and Murr presided over an anti-corruption campaign which targeted Hariri's political allies and diverted the "spoils" of government spending to their own supporters. Whereas his predecessor, Elias Hrawi, had been politically weak, Lahoud hoped to establish a political power base in Mount Lebanon that his son, Emile, Jr., could inherit after his departure from office. One of the factors which sealed Lahoud's alliance with Murr was mutual opposition to MP Nassib Lahoud, a distant cousin and rival of the president who managed to "steal" a Metn parliamentary seat from Murr's steamroller slate in 1996. Together, the president and interior minister hoped to not only defeat Nassib Lahoud, but sweep the 2000 parliamentary elections in Mount Lebanon and the north. The 2000 elections did not go as planned. Although Murr's electoral slate won most of the seats in north Metn, Nassib Lahoud was again elected. Everywhere else, candidates aligned with Lahoud lost to supporters of Hariri and Jumblatt. Murr was blamed for this humiliating defeat. In a scathing editorial published after the first round of voting, the pro-Syrian daily Al-Safir accused him of dragging Lahoud into "costly wars" with some political figures "for no convincing reason" and "costly alliances" with others that were not needed. The result, the paper said, was that "the president lost the support of the Sunnis and the Druze without winning that of Maronites." Murr, it added, had appropriated decision-making to the point where he appeared to be the "one and only ruler." In any event, the Syrians wanted Hariri to return to office and salvage Lebanon's moribund economy - and Hariri demanded Murr's ouster from the Interior Ministry. Interestingly, the consensus choice for his replacement was his son, Elias - a much more likeable fellow than his father. However, Murr's supremacy as the political boss of north Metn would be challenged from an unlikely quarter. In the late 1990s, a rift began to emerge between Michel Murr and his brother, Gabriel, the owner of Murr Television (MTV). Although Gabriel had run his brother's political campaign in 1996, a number of factors began to drive them apart. First, Gabriel developed extensive business ties with Hariri - the nemesis of his brother and the president. More importantly, in order to vigorously compete for viewers, MTV began airing reports critical of the government and interviewing popular opposition figures (in 1997, it became the first station to interview former Army Commander Michel Aoun). Ironically, while the pursuit of wealth drove Michel Murr further and further into Syria's orbit, it drove Gabriel Murr into the ranks of the opposition. As Gabriel was honing his stature as an opposition leader, Elias was bearing the brunt of rising Christian dissatisfaction with the government, and with the Interior Ministry in particular. In August 2001, internal security forces carried out a massive arrest sweep against anti-Syrian dissidents. MTV broadcast tales of beatings and mistreatment by those who were released. 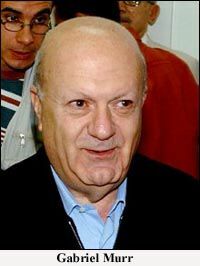 In April 2002, Metn MP Albert Moukheiber passed away, leaving vacant a Greek Orthodox parliamentary seat in the heart of the Metn. Although Michel and Elias were content to let Moukheiber's nephew, Ghassan, run unopposed in the subsequent by-election, Gabriel declared his candidacy and began actively campaigning for the seat. Michel, in turn, picked his daughter, Myrna, to run against Gabriel. Thus, a routine by-election became an unprecedented test of strength between the pro-Syrian political order and the Lebanese opposition. Aoun's Free National Current (FNC) and the Lebanese Forces movement, which had boycotted all previous parliamentary elections, threw their support to Gabriel, as did most Christian opposition groups. With Christian disenchantment toward the Syrian occupation at an all-time high, most opposition leaders were confident of victory in the Maronite Christian heartland. However, Gabriel faced the most sophisticated and corrupt political machine in Lebanon, which employed all of its customary tactics to compromise the integrity of the election. Lebanese news stations broadcast the arrival of bus after bus carrying naturalized Syrians from east Lebanon to the polls. Elias issued a brazen reminder to the public that the use of curtains in the voting booths was "optional." He and his father were so confident of Myrna's victory that she had hardly campaigned at all. After unofficial results published the next day showed Gabriel narrowly winning the election, supporters of the opposition throughout Lebanon rejoiced. "Gabriel Murr victory is turning point for opposition," declared the daily Al-Nahar in its front-page headline. However, the Interior Ministry declined to publish the official results, amid rumors that it was planning to invalidate the ballots of an entire village because one person forgot to sign his name. This provoked an outcry not just from the opposition, but in the editorials of virtually every newspaper in the country. After a two-day delay, Elias announced solemnly that Gabriel had won the election. Gabriel's victory would be short-lived, however. In September, the authorities shut down MTV on the grounds that its broadcasts had violated a ban on political propaganda and harmed relations with Syria. In November, the Constitutional Council overturned his electoral victory, ruling that Gabriel had violated laws prohibiting televised campaign advertising (i.e. that MTV's coverage of the campaign was so one-sided as to constitute campaign advertising). Although the result of the election was annulled, it nevertheless demonstrated that the formidable Murr political machine was no longer capable of "manufacturing consent" in the Christian heartland. Elias Murr continues to follow in his father's footsteps. Last month, Deputy Parliament Speaker Elie Ferzli accused the Interior Ministry of illegal contracting that squandered millions of dollars in state funds. According to Ferzli, the ministry signed a contract with a Saudi-Belgian conglomerate to construct facilities for testing car roadworthiness, despite receiving better offers in a public tender. The company, which Ferzli said was "backed by powerful figures," was also given the free use of public lands to build the facilities, despite the fact that it's build-operate-transfer (BOT) contract obliged it to assume these expenses. Public Works and Transport Minister Najib Mikati subsequently revealed that property belonging to his ministry in the northern port of Tripoli had been confiscated for this purpose without his knowledge. Chantal Rayes, "Murr, le rempart de Damas," Liberation, 28 August 2000. "The Quarry Quarrel," The Lebanon Report, No. 3, Fall 1996. Al-Safir (Beirut), 31 August 2003. Voice of Lebanon radio, 4 May 2003. � 2003 Middle East Intelligence Bulletin. All rights reserved.